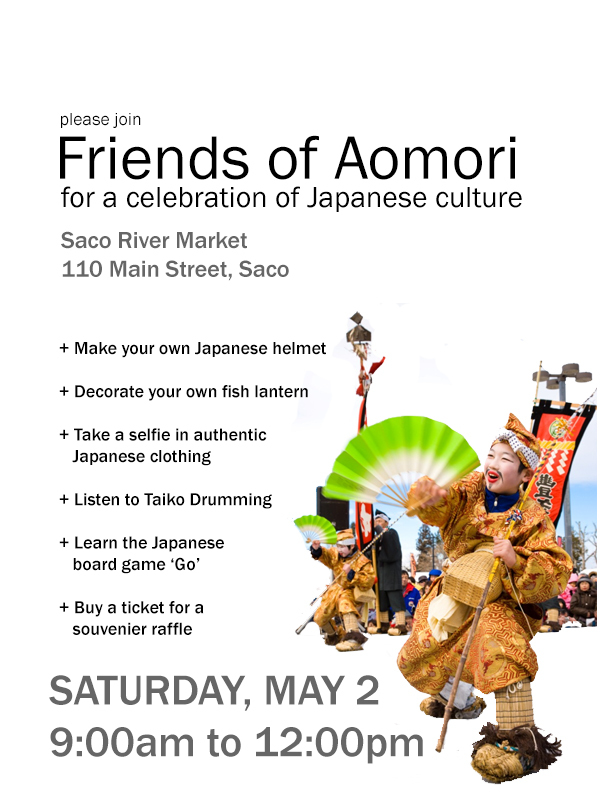 Please come and support Friends of Aomori and the Maine-Aomori school exchanges at the Saco River Market (110 Main St. Saco) on May 2, 2015 from 9:00AM to 12:00PM. Join us in making your own Japanese helmet, decorating your own fish lantern, and taking “selfies” in traditional Japanese clothing. There will be live Taiko Drumming and and you can learn to play the Japanese board game Go and partake in a raffle! More precise information about the schedule and events will come soon! Thank you for your continued support of the Maine-Aomori Relationship!